Networking is just a singular word that means “going up to people you don’t know and starting a conversation about yourself”. Kinda like picking someone up at a bar, with perhaps the same amount of awkwardness but (hopefully) less innuendo. I) Get yourself some good opening lines. Always keep the classic “Hi, my name is…and I’m…(job title)…/I’ve just graduated from…/I’m interested in…”. But also come up with a few others that are specific to the event you’re at and the subsequent interests or experiences these people may have. What brings them here today? How are they connected to the event? Do they know anyone else here? and so on. II) Handshakes are equally important and are NOT a men-only thing. A strong, firm handshake is more meaningful than some weird, soft wet-lettuce type hand holding. Use your whole hand, none of this finger clasping business, and shake firmly once – maximum twice. Anything else just gets weird and can show lack of confidence. 3. 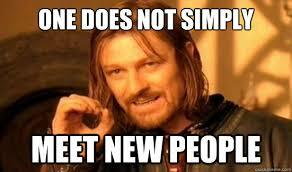 Networking can be quite daunting, particularly if you’re a recent graduate or new in your role. You can feel as though you don’t have anything interesting to say, which may be true – however you will eventually have something interesting to say, and in the meantime the people you’re trying to talk to right now will almost certainly have good things to say. When you’re new at this, the key thing is to GET PEOPLE TALKING. 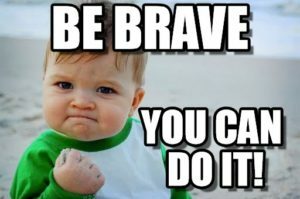 Taking the pressure off you, but still learning something. Wins all round. I) ALWAYS REMEMBER PEOPLE’S NAMES. I cannot stress this enough. If another colleague comes over part way through your conversation and you can’t remember the name of the person you’re talking to to introduce them…it’s going to be SO AWFUL. Just don’t do it. 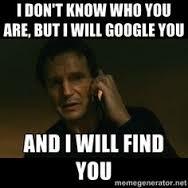 II) Google people after you meet them. To allow this to happen, you must ALWAYS REMEMBER PEOPLE’S NAMES. You never know who you might be speaking to. If you Google them afterwards, the next time you meet you’ll have more insightful questions to ask than “so how was your journey here? The weather’s doing strange things today isn’t it?! I never know whether to wear a coat…” and so on. 5. Get yourself some business cards. Whether you work for a company or not, it’s always a good idea to have something small and convenient to hand out with your details on should the opportunity arise. No-one wants to scrabble for a pen and paper, and putting your number in their phone will seem too personal too soon. Cards keep things simple, quick and professional. 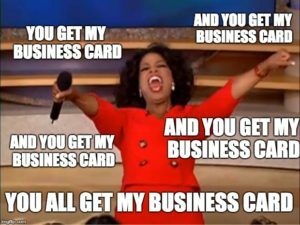 You can get 100 cards starting from £8 from places like Vistaprint – just do it. 7. Know when to move on. 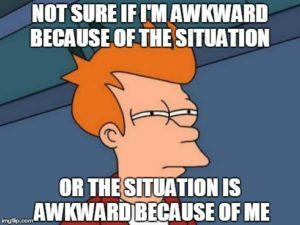 There will always be a natural flow and ebb of conversation, but there will also come a point where it’s just ebb ebb ebb…Don’t let it get to the ‘awkward silence’ stage, always try and leave on a flow point. Just say “It was really great to meet you/talk to you” followed by a reference to your conversation with them (e.g if they told you what seminar they’re going in to next, you’d say “and I hope you enjoy…” or “let me know what you think of…”). Do this, zero #awkwardturtle. Networking is an important part of almost every job, even more so if you’re a freelancer. Networking will get easier the more experience you have of it. Just be confident, ask questions and use those all important “people skills” you spoke about in your interview.